Alley of Dreams: The Road Not Taken…..
An unusual title for an unusual poem. I first read this poem on a ‘tense’ summer afternoon, neatly printed on our English Examination paper under the title Part I (Reading Comprehension). My hands trembled as I lifted the question Paper carelessly tossed on to my table by the invigilator. Tiny rills of sweat trickled down my temple. It was indeed a hot afternoon. The roll numbers written on the polished mahogany desk had already started to fade. The lengthy question paper and the pin drop silence of the examination hall made me more uneasy. Quickly I whispered a small prayer, ( the sure shot antidote to such situations) and sifted through the questions. But little did I know that I was about to confront a piece of writing that I’ll remember for the rest of my life. …. Never before did I become conscious about the power of words to invoke a metaphor so vivid that it expresses an uneasy dilemma in life so effortlessly. Many a summer has passed since then, but the hidden meaning in the poem still holds true and continues to intrigue me. 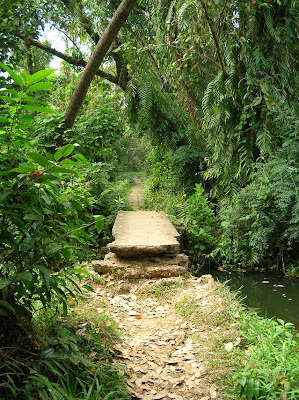 The images were clicked on an impromptu trek into the Kumarakom Bird Sanctury , Kerala. What lines! Sums up a lot of things...Frost grew in rural US and that's why his verses are full of nature, and I guess that's one additional reason (apart from the content) why we connect with his poems so effortlessly. And yeah, your post reminded me of the school days :) April days, hot windy afternoons of Central India, and horrible History exams...everything else was fun, science, maths, geography, languages, except history and economics...2 subjects I would give anything to just scrape through :) The only time I got good marks in history was when they taught us various revolutions, Russian, French...You could be really imaginative and gory in there! finally..a post from you..and what a lovely post too.. Thanks for insight...economics of course wasn't my cup of tea either. But I used to love history till the time the revolutions start...and then it's all hell break loose for me. Happy to see you here...so when are you reviving your blog? Saw the new look you've given it. Hi Sandeep... this is one of my favourite poems too! Brought back memories of my school days when my english teacher first provoked us to see through the lines and understand their depth! ... and lovely pictures too! Great post bro! I just peeped in to check updates on your blog. I wonder how you remember your school days even now. am passing by after a really long time, and thank god not for nothing! A dreamer by birth... A Landscape Architect by profession... An alterego to my self... But all in all...just another brick in the wall. With dreams to bring about a positive difference to this world.